We came up with the idea when selling Jason's, very successful, IT business in 2012/2013. 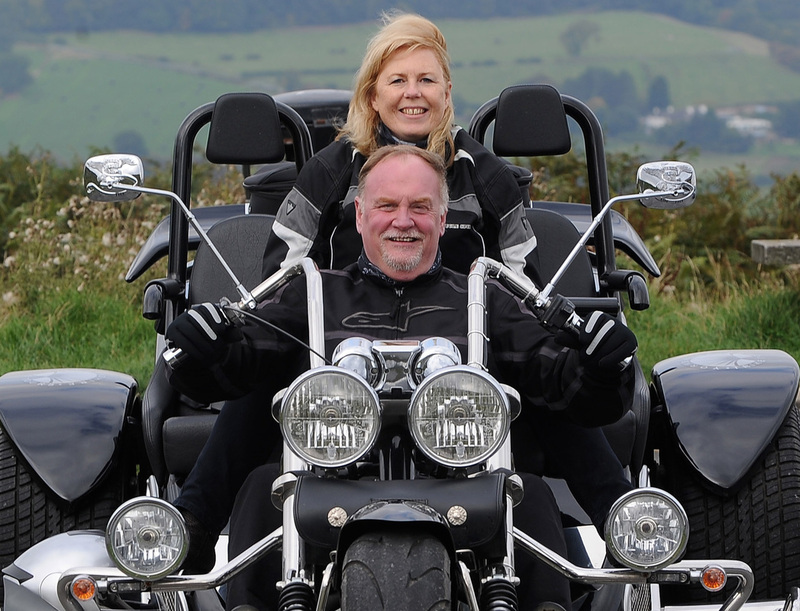 It gave us a new business opportunity, where we could combine sharing our love of riding on our trike with the passion we both have for the Yorkshire Dales. We had enjoyed a trike, for fun, for some six years and during that time everywhere we went people came to talk to us and find out all about our adventures. Now we thoroughly enjoy working in the beautiful Dales on a vehicle that enables people to experience the area in this unique way too. Jason always tells people he has the best 'office' in the world, as he takes people on tours in everyone of the Dales. We both feel privileged to have met so many special people on the almost 250 tours we have done so far. It makes us both really thrilled to see people have such a great time and to see the pleasure that touring on the trike gives them in such a beautiful place. Good for the soul! We give a very personal service to our customers and love guiding them around the area telling them the history and interesting details of the Dales. We hope to whet their appetites to ensure they want to come back and stay longer. No one else does what we do, where we do it! On the trike you feel the thrill of being on such a quirky vehicle, yet are comfortable and safe. On board you feel immersed in the environment you are travelling in; you feel the wind and you smell the air. It is a very different experience to being in a car or a bus. We think of it as all the fun of cycling, without the sweating and chafing! That is probably the hardest question to answer. There is something amazing about every Dale, in every season, in every kind of weather. If I were pushed to choose i love the quieter dales, like Birkdale, Garsdale and Kingsdale. They are wonderful places to be alone and fill one with a sense of wonder and peace. I know other people would get that in other dales too. Also, if you want a traditional Dales show we particularly love Muker Show. It is less crowded than many and yet has all the ingredients of a good day out. It depends what you are looking for, but if you want a taste of the unexpected, try Herriots in Hawes. It is a small cafe and art gallery but the food is superb; always fresh and delicious and there is always something beautiful to look at in the art around the walls. For that special stay and excellent food i would go to Swinton Park, Masham, or the Devonshire Arms Hotel, Bolton Abbey. The truth is we are very blessed for great places to eat and stay. It is a pleasure to have to visit so many accommodation and food providers in the area, in the name of research, of course. We work with Low Mill Guest House on one of our tours and it is a wonderful place to stay. Where in the Yorkshire Dales do you feel sudden swooping joy? 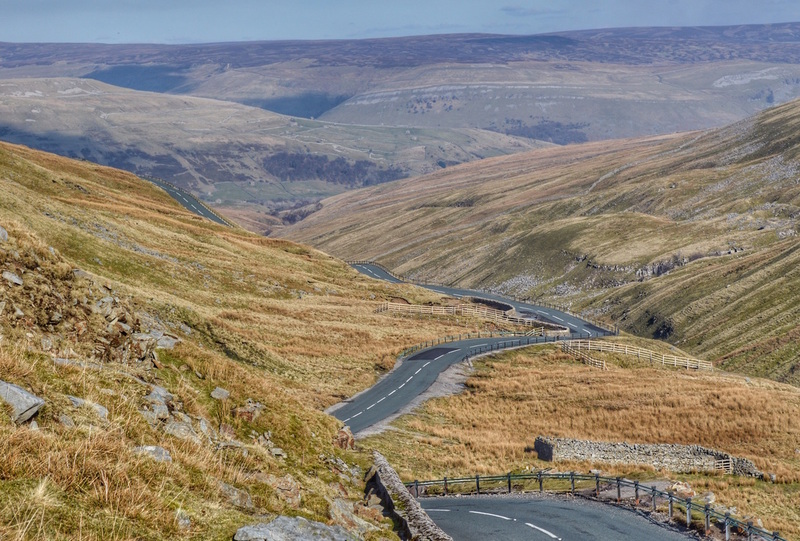 There is something truly fantastic about descending off Buttertubs Pass and seeing Swaledale in all its glory, especially on a Summer afternoon. I also love Jervaulx Abbey which many people don't know about. It is a very special place and the Tea Room is worth a visit too! Is there a happy detail in everyday life that you enjoy, but many of us miss? Giving people pleasure on the tours when they get the chance to do something they have always wanted to do. There is also the joy of working with other people in business in the Dales. They are such fun to work with and so down to earth and honourable. The summit of Coverdale, near the Aberdeen Angus cattle that you usually find up there, grazing. Whatever the weather it is awesome. Can you name a local person who you think embodies the Yorkshire Dales spirit? I would have to say Jason. He is honest, determined and very straight forward. Passionate about the area where he was born and bred, Jason continually strives to know more about the Yorkshire Dales and to share that enthusiasm with our customers. He is my 'Trikeman of the Dales' ! We are the first and only fully private hire licensed trike in Yorkshire!